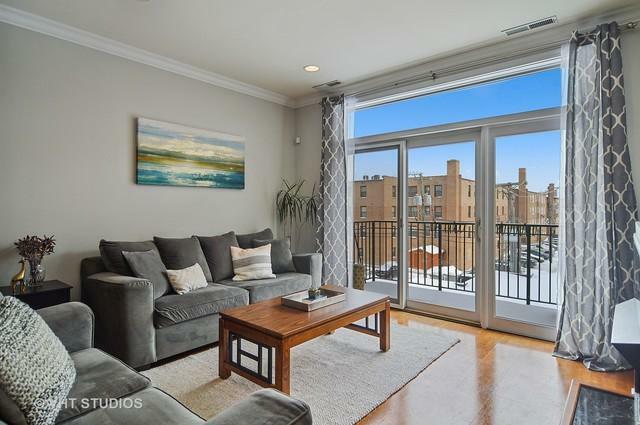 Spacious, freshly painted condo in Lincoln Square with cheerful, east-facing light and hardwood floors in an intimate elevator building. 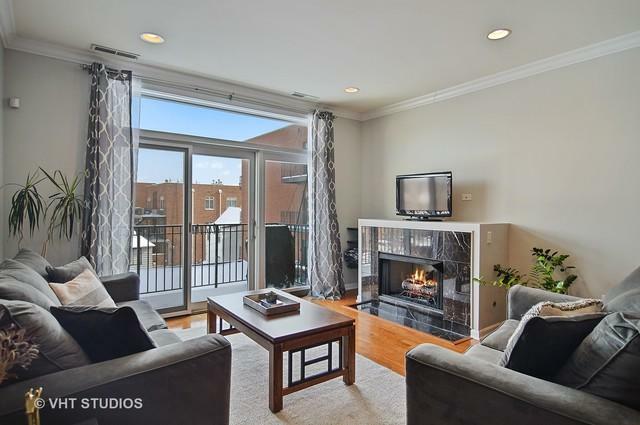 Quiet unit (not facing Lincoln or Foster) features an open floor plan with a large Living/Dining room combo with plenty of space for dining table, a gas fireplace, crown molding & balcony. Beautiful kitchen with an oversized breakfast bar has granite counters, stainless steel appliances and ample wood cabinetry. Large master suite has a huge walk-in closet and a marble bathroom with a dual sink vanity, fresh white cabinetry, a soaking tub and separate shower. Spacious guest bedroom and bathroom with custom vanity lighting and additional soaking tub. 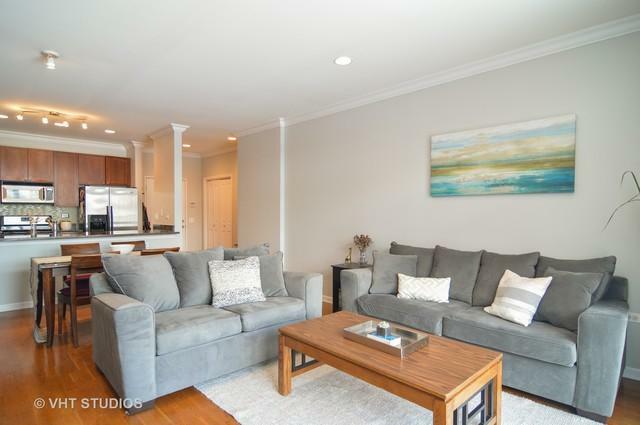 In-unit laundry, storage closet, and attached garage top off this wonderful home. 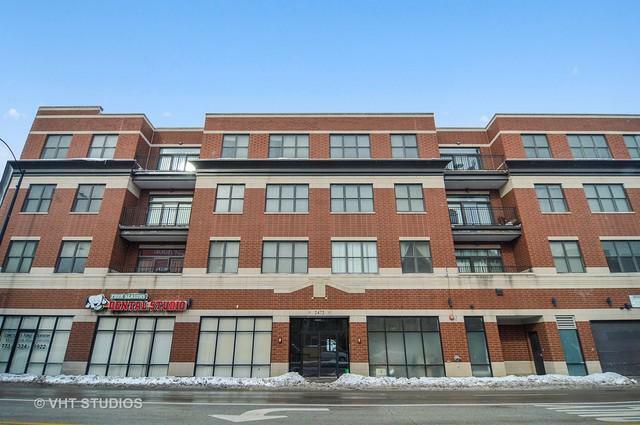 Immaculately kept elevator building just around the corner from the new Tony's Fresh Market and everything that Lincoln Square has to offer! Attached garage parking additional $15,000. © 2019 Midwest Real Estate Data LLC. All rights reserved. IDX information is provided exclusively for consumers' personal, non-commercial use and may not be used for any purpose other than to identify prospective properties consumers may be interested in purchasing. Information is deemed reliable but is not guaranteed accurate by the MLS or Littlefield Group | Keller Williams Realty. The data relating to real estate for sale on this website comes in part from the Broker Reciprocity program of Midwest Real Estate Data LLC. Real Estate listings held by brokerage firms other than Littlefield Group | Keller Williams Realty are marked with the Broker Reciprocity logo or the Broker Reciprocity thumbnail logo (a little black house) and detailed information about them includes the names of the listing broker. Some properties which appear for sale on this website may subsequently have sold and may no longer be available. NOTICE: Many homes contain recording devices, and buyers should be aware they may be recorded during a showing. Data last updated: 2019-04-25T23:52:28.377.